... in with NEW! 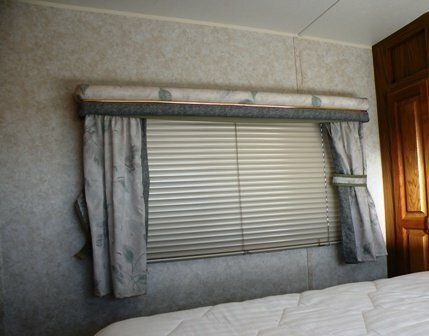 Cellular RV window blinds by Bali! 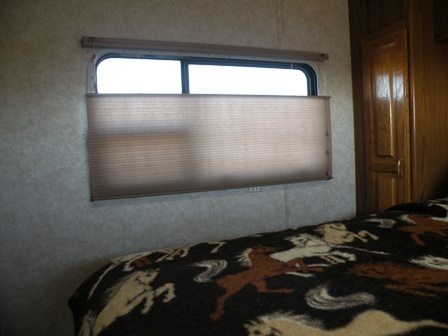 ...We opted to swap out all the RV window blinds in the rig, as part of our RV Remodel. Ok... Now, that's an easy thing to plan... but the lil' buggers ain't cheap, so while the planning is easy, the execution is a mite more costly... we're making the change on the "Budget Plan". 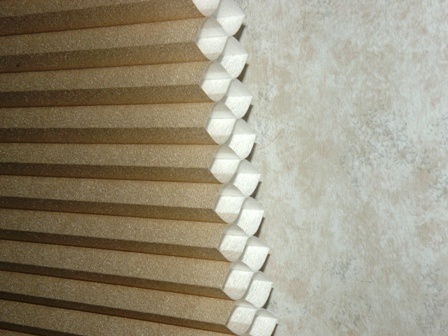 ...with new aluminum, slatted, mini-blind style shades, and have the same old hassles with cleaning... we made the choice to put in a lot better quality and function, with window blinds of the pleated, cellular style from Bali window shades. Now... I'm calling these "RV window blinds"... but truth is... they're simply plain ol', regular, cellular window blinds that we ordered through the local, Lowes Home Improvement store. This first set, to replace the only one on the rig that was broken, and it's sister on the other side of the bedroom set us back $113 a piece. 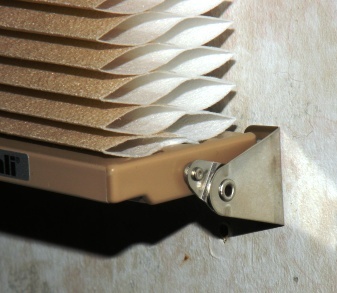 Another attribute of the Bali made blinds we ordered is that the hold down brackets are metal... not the quickly failing, plastic hold downs you usually find in an RV. 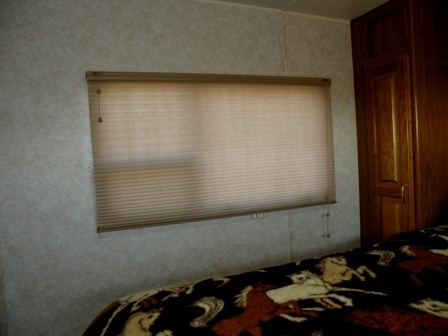 There's more to RV window shades than just light and privacy! Outside, the March temperature that night, on the High Plains of Colorado was down in the twenties... Kinda cool! One window had had no shade in place at all for a bit... the broken one having been removed and taken with us to use for getting the correct size, to order the replacements. With the new blinds in place... it struck us pretty clear that the insulating qualities they possess were surely noticeable. I'm told they'll be easier to clean... either with a damp sponge or with a brush on a vacuum... but that'll have to wait to be seen, sometime in the future. 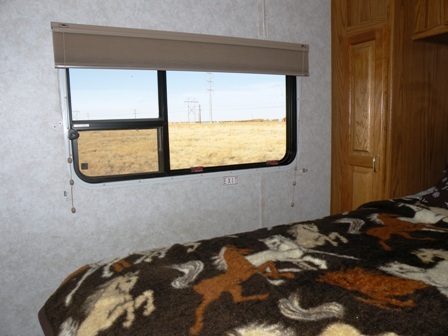 For now, we'll just enjoy the improved function and aesthetics of our new Cellular RV window blinds... and work on the design for recovering the Valances that will be reinstalled over all the window shades!